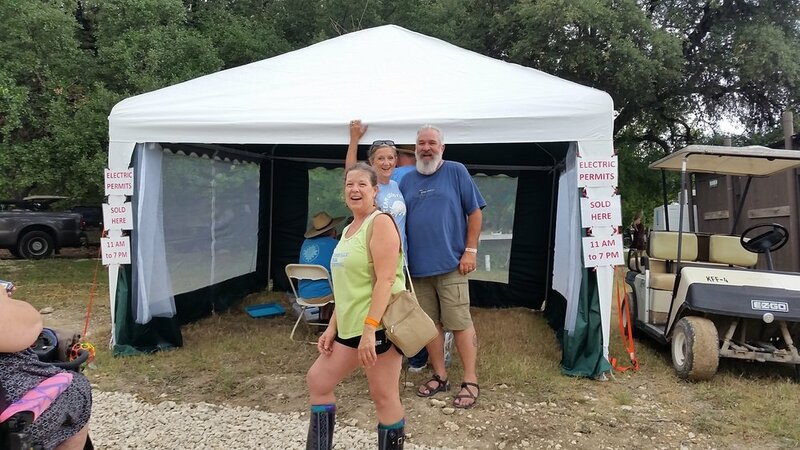 Camping on the Ranch is the best way to experience the magic of the Kerrville Folk Festival. Some amazing music can be heard in the Campground 24-hours-a-day. The 20 acre scenic Hill Country Campground is adjacent to the Kennedy Outdoor Theater. and Kennedy Theater has benches for seating, food vendors and craft vendors. The Threadgill Theater, Chapel Hill, the Kerrtry Store and more food vendors are in the Campground. We invite both tent and RV campers. Food, beer, soft drinks, coffee, and ice are available in the campgrounds at the Kerr-try Store and the Kerr-Café. Warm showers and clean (albeit primitive) toilet facilities are located throughout the campgrounds. Firewood is usually available. NO PETS* are allowed on the Ranch during the festival. NO DRUMS are allowed during the festival. NO FIREARMS OR CONCEALED WEAPONS! NO STEREOS OR RECORDED MUSIC are allowed to be played in the campgrounds. NO ONE UNDER 18 CAN BE ADMITTED WITHOUT PARENT OR GUARDIAN! NO TOLERANCE for sexual misconduct or harassment! *Service Animals - we do allow trained, certified "Service Animals" as defined by the Americans with Disabilities Act. "Emotional Support" animals ARE NOT covered under the ADA and therefore WILL NOT be allowed. The Campground is somewhat primitive (as compared to a State Park), but are pleasurable if you are prepared. Reservations are not needed for tent camping. You simply set up anywhere in the Campground you find an inviting space and feel comfortable. It can get a little “cozy” in the Campground on the weekends, but Quiet Valley Ranch is one of the easiest places in the world to make new friends. Simply respect each other and you will be in for the time of your life! This is fairly rugged Hill Country terrain so dress comfortably. Shorts, t-shirts, a hat, and outdoor shoes usually do the trick. Be prepared for rain! Afternoon thundershowers are not uncommon. Some good rain gear, both for your camp site and for your body can make a big difference! We suggest you bring a shade canopy. Food service vendors are in the Campground for breakfast, lunch and dinner and at many more at Main Stage during the 10 weekend evenings. Many campers bring anything from bare minimum to elaborate cooking gear. Potable water on the ranch is provided by Aqua (treated and approved by the County Health Department). Many campers bring their own drinking water. Communal water outlets are provided in the Campground. Additionally, there are several free-standing electric & water spigots scattered throughout the Campground. These are available on a first-come first-served basis. You are required to purchase an Electric permit for electricity ($6 per day or $13 per day for an outlet with AC connection.) Many of these electrical plug-ins will accommodate a/c's, but not all. Ask the Electric Permit Crew upon arrival for questions about a/c capability. If you wish to leave a hose connected to a spigot, please provide a hose splitter so that others may get water too. Campground access fees are included with every festival ticket. You will be issued a festival wristband at the Ticket Booth for no additional charge. You must have a valid festival wristband in order to enter ANY festival or ranch gate during the festival. Parking Lot fees are included in the price of tickets. Campers may purchase a "preferred" parking permit from the Festival Office which allows parking in a section closest to the Campground. In order to have as much room for tents as possible, we discourage parking vehicles in the Campground. Vehicle parking in the Campground is an additional $25 per day. For camp set up, you may pay a $25 refundable cash deposit provided you move your car to the parking lot within an hour. The parking lot is approximately 100 yards from the Campground gate. Kerrtesy Karts provide campers with transportation from the parking lot to the Campground. Folks who intend to use a vehicle as their campsite (sleeping in an RV, trailer, van, or truck with camper shell, etc.) purchase a Sleeper Vehicle Permit at the campground entrance, (Known as Mix Master). A Sleeper Vehicle Permit is $25 (in addition to your Festival tickets). Sleeper vehicles are, for the most part, to be considered as "tents". As long as your vehicle stays in the Campground, regardless of the length of your stay, no additional camping charges are collected. If your vehicle leaves the ranch you pay $25 for EACH re-entry. We have 91 RV sites in the Campground. 57 of them have full hook-ups. Typically, there is a waiting list for these sites during the Festival. Advance reservations and restrictions apply. For more information, please email Dorothy@kerrville-music.com or call the office at 830-257-3600. If you have an RV and an generator, you may reserve a space in our overflow parking lot located across Hwy. 16 from Quiet Valley Ranch. RV Camper with No Room at the ranch? Check out Jellystone Park in Kerrville! A Family Friendly Festival Friendly Place to Stay! Open fires should be within fire rings, BBQ grills or outdoor type fireplaces. LARGE BONFIRES ARE NOT ALLOWED! Fires are not allowed during periods of excessive drought or when Kerr County has issued a county wide burn ban. During a burn ban, only charcoal fires in BBQ grills are allowed. Gathering firewood on the property is not permitted. A limited amount of firewood is usually available near the Kerr-try store. If you think you need a lot of wood, please bring your own. PLEASE, no fires under trees, branches or next to wooden structures. Fires MUST be attended at all times and must be completely extinguished before retiring for the night or leaving the campsite. We recommend keeping a 5 gallon bucket of water next to your fire. Please share fires when possible, it’s more fun that way anyway.